I’ve been on a burger binge lately. I think it’s one of the comfort foods that really isn’t all that evil if you do it right. Of course, it can get evil fast, with mayo and cheese and grilled onions, but a burger with just lettuce, tomato, pickle, and raw onion can fit into a pretty healthy diet. It’s just ground beef, with vegetables, on a bun. Not great for you, with all the saturated fats and such, but things could do a lot worse to your body. That’s the health angle. From a pleasure standpoint the burger is king. Mark it down, I would rather have a burger than pizza. There, I said it. I don’t seek out new-to-me pizza places as much as I seek out new-to-me burger places because burgers provide more satisfaction. High pleasure value and may not kill you that quickly – that ain’t bad. So it’s nothing for me to descend to the depths of a food court for a burger experience. And descend I did for M Burger – to the subterranean Thompson Center food court. It’s perhaps the worst atmosphere I’ve ever consumed a gourmet burger in, which affected the experience a little bit, but the burger came through it okay. M Burger is the creation of Lettuce Entertain You Enterprises. There are a handful in Chicago right now and they’re trying to capitalize on this real or perceived market for reasonably priced gourmet fast food that’s fresh and sourced locally. They get it right, but they aren’t destination burger joints that you would take a date to. My expectations were a little askew; M Burger is no Edzo’s, but it’s a great fast food lunch. I had the double with lettuce, onions, pickle, and special sauce. That’s their standard condiment stack. I always go with the house condiment stack no matter what. Sure, if I’m building it myself, I do lettuce, tomato, pickle. That’s all. Mayo, mustard, ketchup, and special sauce don’t do much for me, unless the burger is really dry. But who am I to say what’s best on a burger. I’m not a chef. I don’t know. I’m open to suggestions and if they want to toss some special sauce on, that’s cool with me. My stock answer when asked by the counter person is, “Everything that’s free.” That usually excludes things like bacon, cheese, and grilled onions, which don’t add any value for me. It was good. The patty is a quarter pounder fried on a griddle. 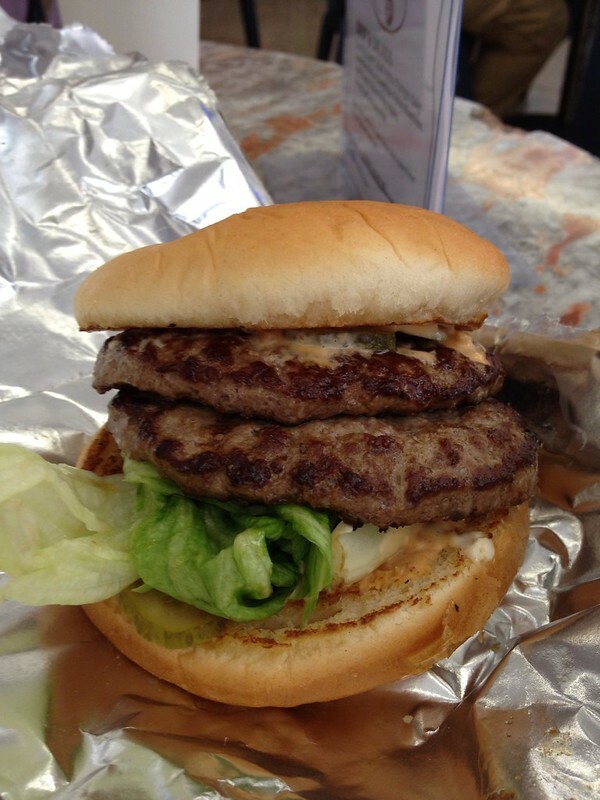 It’s pretty lean, there’s no grease dripping or glistening pools visible on the burger. The special sauce seems In-n-Out-ish in its nature and adds some good flavor and texture. M Burger is one of the rare burger places who don’t use tomato as a standard topping. I’m okay with that (I think you can get it, I didn’t ask). The tomato is the single biggest perpetrator of the broken burger: the one that falls apart in your hands from too many toppings and too much juice. In this case, with the double stacked quarter pounders, a tomato slice would have killed the center of gravity. I appreciated the clean experience because it was the work day, I was with another human, and I had a collared shirt on. I have an image to keep up. It all fit together nicely and tasted great. I paired it with an order of fries, which are thin cut with some skin on. The burger was $3.99 and the fries $1.99, so it’s more expensive than fast-food but not out of line. I’ll be back. You should go. Let’s meet for lunch some day. Posted in food on 2012/08/07 by John.